About a month ago my Greek neighbour and I had an exchange of homegrown fruit. She gave me a about 12 kilos of Prahran grown olives for a bag of Prahran grown lemons..Fair exchange I think! I'm not sure what kind of olives these are but they are tiny! I usually use jumbo Kalamata olives when I brine my olives. There was no way that I was going to individually split these. I have left them whole and they are sitting in the brine. I will taste test when I get back from Greece! If you get your hands on larger olives use the method below. In a saucepan add tepid water and a fresh egg. If the egg is fresh it will sink. Add salt one cup at a time until it dissolves. Continue to do this until the egg floats to the top. Use this for your salt water. Once you have completed step 1 place your olives in a large jar and add the above liquids in order and continue to do this until all olives are covered. Tightly seal and leave for at least a couple of weeks. You can store in the brine for a year plus! Marinade when needed. 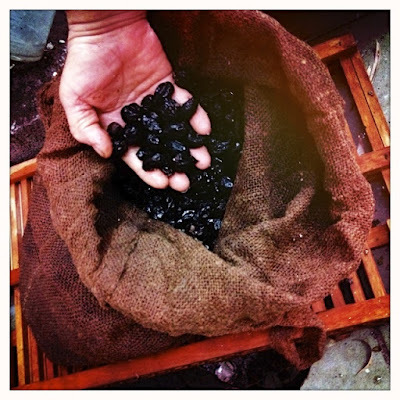 Thrombes are the wrinkly black olives that you find in Greek delis. Mum just gave me some of this seasons batch. Delish! 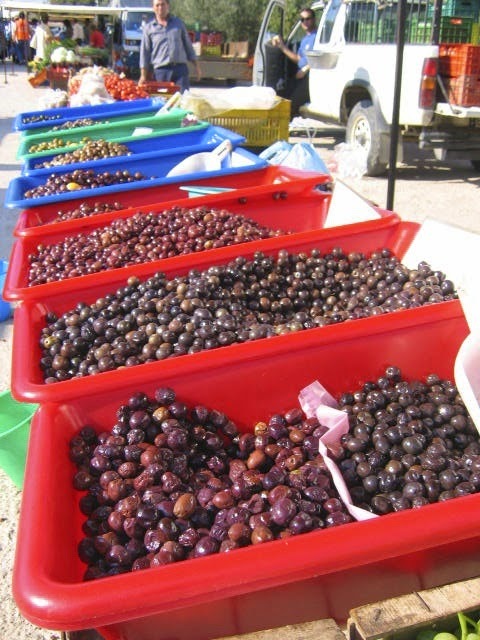 Pick only very ripe black olives. Place in a hesion bag and cover with rock salt. Mix well and ensure that ALL olives are covered with salt. Every day turn the bag over and weigh it down with a plate and brick . Turning it ensures that the salt is evenly distributed. All bitterness should be removed by this process in about 1 months time. Start taste testing after a couple of weeks..